In September 1731, Constable of Leeds Richard Nottingham and his men have to stop a riot when a visiting dissenting minister tries to preach. Three days later the minister’s found dead, knifed along with a whore. But it’s the prostitute Nottingham cares about, Pamela, once a servant to him and his family, later married to a farmer. What brought her back and who killed her? As more men and whores die, Nottingham faces immense pressure to solve the crime. They mayor wants answers and Nottingham has to solve the crime before a local pimp whose girl is among the dead. Meanwhile, at home, his younger daughter is becoming ungovernable and he has to try to control her before her wildness turns deadly. As the strands of his life come together, Nottingham finds that the answers he desperately needs carry a large price. 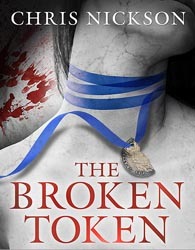 The Independent has named the audiobook of The Broken Token as one of its Audiobooks of the Year for 2012. Buy the ebook (the paperback is out of print) or the audiobook.